Property sales rose slightly in October, for the second month in a row, the National Association of Estate Agents (NAEA) said. Its survey showed that the average estate agent sold seven properties last month, up from just six in September. The NAEA said sellers were now being more realistic and were cutting their asking prices. 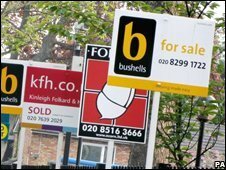 A property search website, Globrix, said price cuts on homes last week averaged £16,871 across the UK. The UK property market is in the middle of the worst slump in living memory because of the credit crunch and a subsequent mortgage drought. Average prices, according to the biggest lenders, have fallen by about 15% in the past year and sales have fallen by more than half. "Sellers are beginning to face up to the reality that their houses are not worth as much now as they were 12 months ago," said Chris Brown, president of the NAEA. "They are ripping up last year's price tags and beginning to come to terms with the new economic reality," he added. The realisation by sellers that they need to cut prices is reflected in figures compiled by the property search website Globrix. Its data shows that across the UK 5,803 properties were subject to a price cut last week, averaging £16,871 each. In Norwich 2.6% of sellers cut their prices, by an average of £13,683 for the 106 properties concerned. In Solihull 40 properties (2.2% of those on the market) had their asking prices cut by an average of £13,130. That was followed by Rotherham where the 38 properties (2.2%) whose owners slashed their prices did so by an average of £9,210. "Buyers are now holding all the cards and sellers need to realise that if they want to sell in this market then they may have to accept an offer they wouldn't have even considered six months ago," said Daniel Lee of Globrix.